As compared to insurance or insurance-backed coverage providers, Legal Services companies are basically firms that provide financial support and legal services to cover you if you are involved in a self defense incident. There are items that they do not cover such as civil suit damages. The top four companies are listed below with brief information concerning their service offerings. ​Can you survive the legal aftermath of self defense? –Grants of further funding for legal defense expenses after justifiable self defense if criminally charged or sued in civil court. Education: 8 full-length lectures on DVD and a 235-page book so you know what’s justifiable, what to expect and how to best interact with the criminal justice system. Guidance from our Advisory Board comprised of the recognized leaders in self-defense training: Massad Ayoob, John Farnam, James Fleming, Tom Givens, Emanuel Kapelsohn and Dennis Tueller, led by Network President Marty Hayes. Access to a growing nationwide network of attorneys and legal experts. Read more here. Monthly education and updates through our online journal. Start your education now! Click here to download What Every Gun Owner Needs to Know About Self-Defense Law. To learn more, go to the Armed Citizens Legal Defense Network website link above. ​CCW Safe is a legal service membership plan that was designed for CCW permit/license holders and law enforcement officers, both active and retired. We are not an insurance plan, we are a legal defense service plan. The member pays a flat yearly fee and enters into a legal agreement with the company who is obligated to provide the service listed in the agreement. CCW Safe then takes on the burden of the out-of-pocket expenses associated with defending a self-defense/use of force critical incident (attorney fees, investigator costs, trial expenses and expert witness costs). CCW Safe has been capitalized by investors and has committed assets and reserves. CCW Safe is a privately owned company in a competitive market. CCW Safe has a strong membership base in 50 states. CCW Safe does not have the conflicts of an insurance product because the company is designed to indemnify the cost of the incident and not the outcome of the trials. It is not a reimbursement package and no money is required to be paid back to the company regardless of the outcome. ​You are covered in All 50 states, any place you can legally possess a firearm in a life threatening self-defense incident if you are not carrying concealed. If you are carrying concealed you are covered where your permit/license is valid and honored. CCW Safe are industry leaders and we decided to cover ANY use of force our members choose to defend their lives or the life of another in self-defense. CCW Safe coverage is the same for appeals and mistrials at no additional cost to its members. To learn more, go to the CCW Safe website link above. In researching coverage offered by other companies, we found that sometimes there are implications that a certain coverage exists, and then further research uncovers a much smaller scope of coverage. We have actually spoken to members with other organizations who assumed they had a certain coverage and they discovered their coverage was less than they thought.We have tried to be straightforward when explaining our coverage. To try to simplify what our coverage includes, we are providing examples of scenarios that have been posed to our legal department. Basically, we will pay for the cost of an attorney to defend our member if they are charged, criminally or civilly, in a gun related offense, when they have not violated any Federal law, State statute, or local ordinance. In the majority of cases, we will not cover a gun related incident where a law was broken. There are cases where a law may have been broken, but the incident saved many lives. Those types of situations are reviewed by our review board and may be covered even though the incident violated a law. ​For more information, go to their website link above. 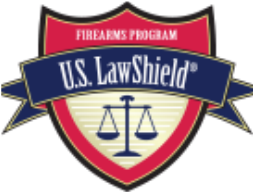 ​If you “use” a firearm or any legal weapon in your membership state under the U.S. Law Shield Firearms Legal Defense Program, our program attorneys will represent you in any legal proceeding (criminal or civil), for zero attorneys’ fees. This includes all criminal charges arising from a “use” of a gun or any legal weapon.